Robyn Henwood comes straight from her yearly "Craftsperson in Residence" at Ayers Rock Resort where she handpaints and prints images of Australia. She has been printing and painting on silk for the last 30 years. She trained in Batik in Indonesia and then at RMIT in Melbourne as a Textile Designer. She spent time at the Jam Factory Craft and Design Centre in Adelaide and now has an established studio where she teaches many print and dye techniques for textiles. 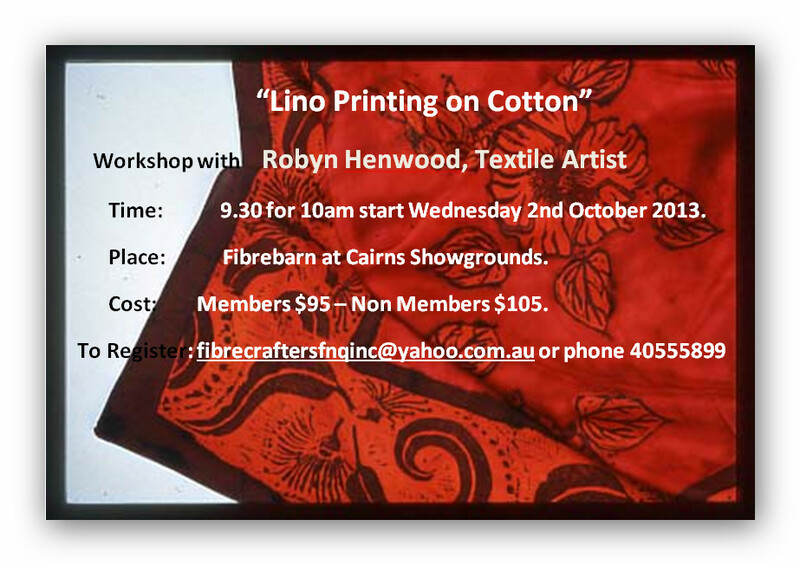 For this workshop, she will lead you in designing and making a simple lino cut repeatable design. You will then print this design on back grounds of fabric that you will create using a variety of mark making techniques. Fabric created this way can be used for quilting and patchwork as well as garments and artworks for the wall. Lino lends itself to making quite graphic, contemporary images which can also be hand-coloured.